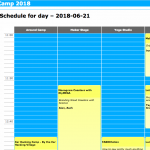 We’ve finally published our conference schedule including all of our talks, workshops, and other events around the camp. If any changes or corrections need to be made that can’t be done through FRAB, please direct inquiries to david@toorcon.org. More info on the TeraHash and AWS sponsored parties, other music events, and kids activities will be published in the next couple weeks. We can’t wait to see you all in a few weeks! This entry was posted in Uncategorized on May 29, 2018 by davidhulton.